Click here to download the Teacher Flyer and Parent Flyer to share Upham Woods highlights with your administrators, teachers, parents, and adult chaperones. To schedule a program, first visit the Upham Woods Calendar to identify available open dates. Once dates are found, please fill out an online application to reserve dates. You will receive an email confirmation of your reservation acceptance. When your date requests have been approved, you will receive a confirmation contract and with a request for a deposit. We have recently established a set reservation timeline for reserving dates for the coming school year for those groups who visit Upham Woods on an annual basis. We will continue to use this timeline each year to make the reservation process easier and more predicable for our groups. 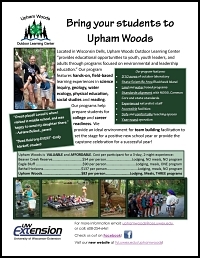 If you are an interested school group that would like to visit Upham Woods during the school season but miss these deadlines, please contact our Program Director at uphamwoods@ces.uwex.edu to learn more about available dates for your group. This timeline applies to school trip reservations for the following Fall and Spring school calendar. Feb. 15: Call for reservation submissions – Online Applications for the next school year may be completed and submitted. We hope this preset schedule will add clarity and predictability to your school season planning process. Any questions can be directed to the Program Director at uphamwoods@ces.uwex.edu or by calling 608-254-6461.